Antibody-mediated rejection (AMR) in renal allografts, which is usually caused by antibodies (Abs) directed against HLAs, is associated with a poor transplant outcome. However, evidence of AMR in the absence of anti-HLA Abs suggests the presence of non-anti–HLA Abs, presumed to react with other antigens on endothelial cells. The authors describe the clinicopathologic profiles of kidney recipients who experienced acute rejection with microvascular inflammation within 3 months after transplantation in the absence of anti-HLA donor-specific Abs. Using a new endothelial cell crossmatch assay and transcriptomic and proteomic analyses, they discovered that before transplantation, these patients carried unknown anti–endothelial cell Abs in their sera that specifically targeted the glomerular microvascular endothelium. An assessment of these unknown potentially deleterious Abs may provide important diagnostic tools to prevent AMR. Background Although anti-HLA antibodies (Abs) cause most antibody-mediated rejections of renal allografts, non-anti–HLA Abs have also been postulated to contribute. A better understanding of such Abs in rejection is needed. Methods We conducted a nationwide study to identify kidney transplant recipients without anti-HLA donor-specific Abs who experienced acute graft dysfunction within 3 months after transplantation and showed evidence of microvascular injury, called acute microvascular rejection (AMVR). We developed a crossmatch assay to assess serum reactivity to human microvascular endothelial cells, and used a combination of transcriptomic and proteomic approaches to identify non-HLA Abs. Results We identified a highly selected cohort of 38 patients with early acute AMVR. Biopsy specimens revealed intense microvascular inflammation and the presence of vasculitis (in 60.5%), interstitial hemorrhages (31.6%), or thrombotic microangiopathy (15.8%). Serum samples collected at the time of transplant showed that previously proposed anti–endothelial cell Abs—angiotensin type 1 receptor (AT1R), endothelin-1 type A and natural polyreactive Abs—did not increase significantly among patients with AMVR compared with a control group of stable kidney transplant recipients. However, 26% of the tested AMVR samples were positive for AT1R Abs when a threshold of 10 IU/ml was used. 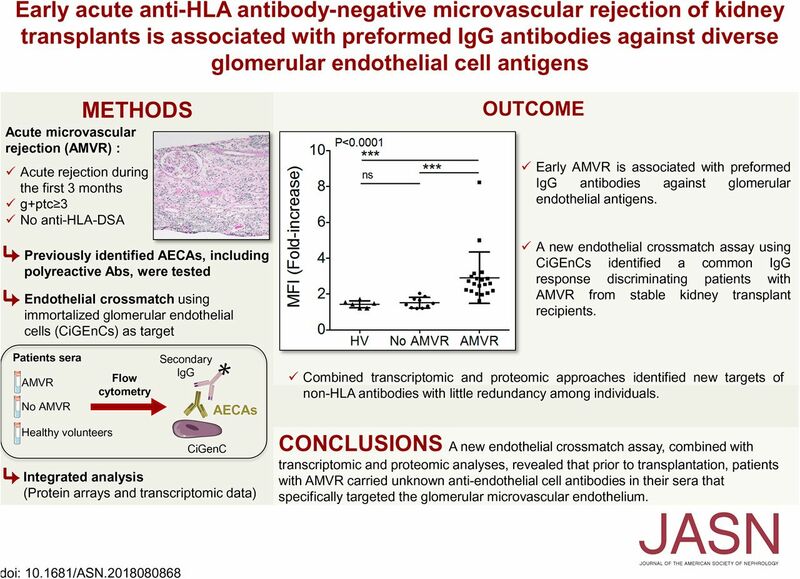 The crossmatch assay identified a common IgG response that was specifically directed against constitutively expressed antigens of microvascular glomerular cells in patients with AMVR. Transcriptomic and proteomic analyses identified new targets of non-HLA Abs, with little redundancy among individuals. Conclusions Our findings indicate that preformed IgG Abs targeting non-HLA antigens expressed on glomerular endothelial cells are associated with early AMVR, and that in vitro cell-based assays are needed to improve risk assessments before transplant.